Chaepmesseller.com is an ED drug selling online store according to the information that I managed to find on their website and according to the list of drugs that I have managed to find on their main page. through this review, customers would be able to find out necessary information about the store such as if the pharmacy offers other ED types of drugs or not, their prices, shipping and payment methods, the technical characteristics of their website, its legitimacy, customer reviews and customer support service. The pharmacy is claiming to offer maximum security to their customers while browsing their website and ordering medications. I could not find any information suggesting for where exactly this online pharmacy is located, unfortunately, as the customers have the right to know such information. But I did managed to find info on their website suggesting that they have 12 years in this business and therefore they are one of the leading pharmacies on Internet. I hope it is true. They are offering safety to customers, privacy which is very important to them and responsibility as everything they do on this website is 100% legal. The company claims to have as a goal the delivery of safe and generic medications at good price. They claim that each product you can find here is Indian FDA approved and internationally certified so the items are safe, high quality generic medicines that are shipped directly from India. With a good customer support service, high quality medications at low prices and secure shopping environment, the pharmacy is trying to make the impression of a really good and legitimate pharmacy. But I am going to check if that’s true or not through this review. As I earlier said, this pharmacy seem to be oriented in selling ED types of drugs as they claim to be an ED online store, they have offers for ED medications and on their website there is a long list of different ED products. However, as much as it seems, all the medications displayed on their main page seem to be absolutely all the medications they have in their drugstore. Analyzing those medications, I can conclude there’s a big list of ED medications including Viagra, Cialis and Levitra as well as other drugs such as: fildena, kamagra, avana, Cialis soft, Viagra professional, Vidalista and others. 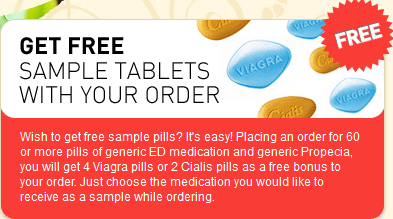 They seem to offer a big list of generic ED products but among brands it seems they are offering only Viagra as there doesn’t seem to be any other branded drug. The pharmacy is not offering a list of categories of drugs and there’s no searching function at all such as keyword search (quicksearch) or search by the first letter of drug. With this being said, you can only purchase medications that are listed on their main page. There are absolutely no other types of drugs except for the pretty big list of generic ED medications and a single brand – Viagra which is also for Erectile Dysfunction. All in all, the pharmacy must add to their drugstores other types of drugs in order to get a perfect rate here. Even if they are an ED only online store, they should be seriously prepared for this and therefore, they should add some other ED medication and most importantly – they should add the branded drugs. All in all, the selection of medications isn’t really big as it consists only in around 50 or so generic ED treating items. My rate is 3 stars here because the assortment of medications isn’t really wide and if they are a pharmacy offering a single type of drug then that’s just not enough. As I mentioned this earlier, the pharmacy claims to be oriented in selling high quality ED items for cheap prices. I am going to check if that’s true by checking the prices for medications and comparing with the prices for same drugs at other places, I will be able to determine if the prices are indeed low. As I said, all the drugs are displayed in a long list on their main page. The drugs are displayed with a price which indicates the lowest price per pill you can get here. But the prices can be much higher. 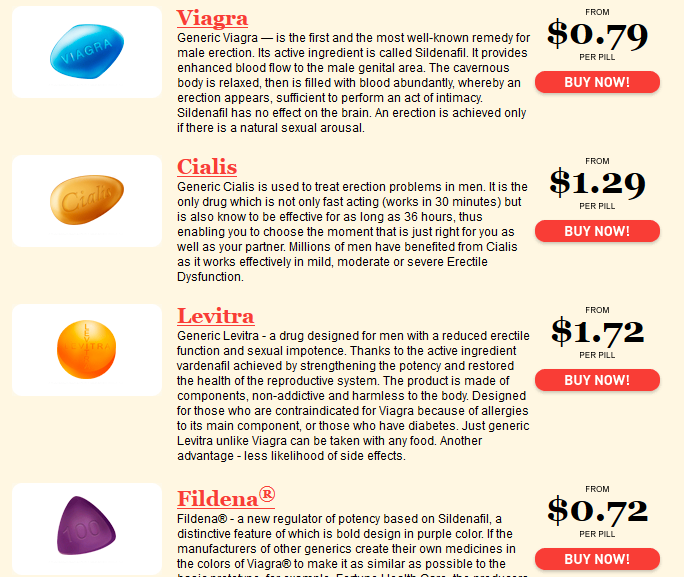 For example, you can see in the screen that the price for generic Viagra starts from 0.79 USD per pill but it can be up to 5.50 USD per pill depending on quantity and dosage. But, assuming you’re going to purchase a normal dosage and quantity which is around 50 mg per pill and 90 pills then the price would be 131.95 USD and so the price per pill is 1.47 USD. To be honest, that’s by far not the best prices as other pharmacies offer same quantity/ dosage for around 80 USD with a price of less than 1 USD per pill. Then, they claim that price per pill of Cialis starts from 1.29 USD per pill but it can be up to 6 USD per pill. Again, assuming you get a normal dosage and quantity (20 mg 90 pills) the price would be 189.95 USD so the price per pill is 2.11 USD. The same goes here as with Viagra – other places have better prices. Seemingly, there are no changes when talking about generic Levitra. 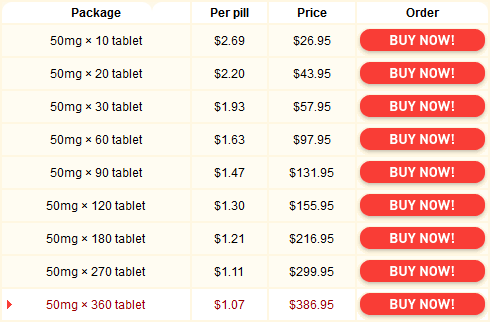 20 mg 90 pills would cost you 229.95 with a price per pill of 2.55 USD. But the price per pill can vary between 1.72 USD per pill to 6 USD per pill. 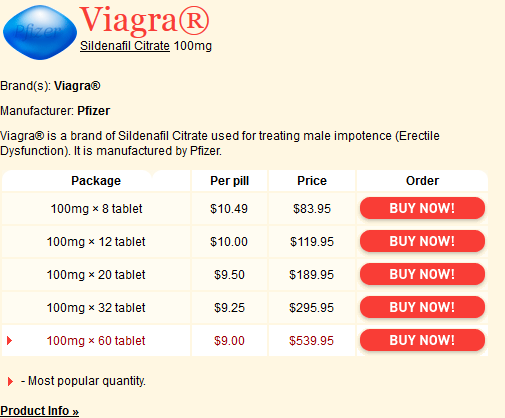 For those interested in brands – I can only talk about brand Viagra by Pfizer which has a price per pill anywhere between 10.49 USD to 9 USD and it comes only in dosage of 100 mg. it only depends on how many pills you purchase. 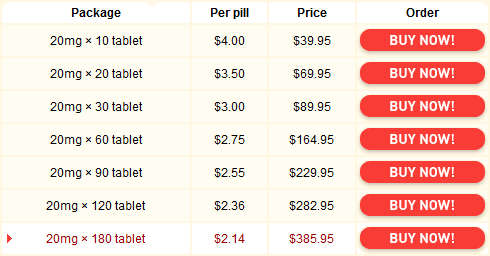 The price per pill is fairly overestimated as other online pharmacies offer much better prices. All in all, I do think that the prices are by far not the lowest. The prices only for generics can be considered a bit affordable as you can save compared to local pharmacy, but the price for brand is quite high. All in all, price policy definitely isn’t the best so my rate here is 3 stars. I was searching for shipping information and shipping options and luckily, I found on their FAQ page an entire department for *shipping* questions. The answers I managed to find there suggest that the pharmacy is offering shipping to almost all countries of the world, for the exception of some countries in Asia. They claim that there are 2 shipping methods which customers can choose from and they include: express international mail that has a rate of 30 USD, delivery of 5 to 9 business days after the dispatch and it does come with online tracking. The second shipping option is standard international airmail with a shipping rate of 10 USD, delivery of 10 to 21 days after the dispatch and it does not have online tracking. The dispatch of products is made in about 1 to 2 days after the order is received and paid. There is no information on their website suggesting that this online pharmacy is offering free shipping and that’s regardless of how much money you spend here – that’s something I definitely don’t like. They are only offering 2 shipping options and world wide shipping with the exception of some Asian countries. I don’t like the fact that they do not have overnight shipping option, no free shipping and long waiting periods with high shipping fee. I think the shipping options only deserve a rate of 2 stars. 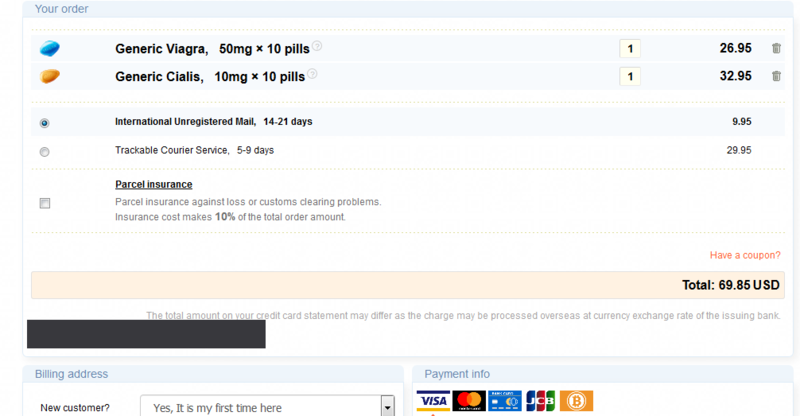 While doing my research I have discovered there are 2 icons on their website indicating what payment methods this online pharmacy is accepting and according to those icons credit cards and bitcoin are accepted. On their FAQ page they suggest to accept payment by credit card but I got on their checkout page and there I found out they accept VISA, Master Card and JCB as credit cards and Bitcoin. Some customers may find these payment methods really good, but there may be others who may need other payment methods such as wire transfer, echeck and others. My rate here is 3 points. I have run the page speed insights test on this website in order to find out what’s the page speed data loading results and I found out that the mobile version of the pharmacy has slow page speed but the desktop version has fast page speed. That’s because the mobile version is scored with 49 only out of 100 and it is red marked while the desktop version is perfectly rated 100 out of 100 which obviously indicates a fast page speed data loading. So, as much as we can see here, both the indicators show an *average* result because of the slow speed on mobile version and fast speed on desktop version. With this being said, I think that this unit deserves a rate of 3 stars. It is exactly as important to check if this online pharmacy is offering a mobile version of their website and that’s because there are a lot of customers that are browsing websites and arranging orders online using their smartphones and other mobile devices. But unfortunately, the mobile friendly test offered by google services didn’t showed any results and that’s because the page cannot be reached. They claim that this could be because the page unavailable or blocked by robots.txt. The page does seem to be available so there’s something wrong with robots.txt. I have accessed the site from my own smartphone and it does seem the site is mobile adapted, but there are huge loading issues. Plus to that, there’s something wrong with robots.txt. This is why they get 3 points here. In order to check if the pharmacy is offering a secure connection you need to check for the green lock near the domain address name in your browser. The green lock indicates that the connection with the website is secure but if the green lock misses it seems the connection is not secured. Luckily, the chaepmesseller.com does use a secure connection as they do have that green lock. I have clicked on that green lock in order to find out more information about it. You can find such information as: chaepmesseller.com uses a high security level of 256 bit SSL encryption which is very good – better than the 128 bit SSL encryption. All in all, I do think that it is all very good, I just don’t like they do not share company owner information. My rate here is 4 stars. As I earlier said, the pharmacy claims to be very secured and offering secure shopping environment. They do offer a security encryption which is very good and they also seem to offer an antivirus on their website as the icons on the site suggest they are McAfee secure. However, I have tried to click on that icon and I was only displayed an informational page but no real prove that they are indeed using an antivirus installed on their site. To be honest, I am not satisfied as I can’t be sure that they indeed have an antivirus and therefore I can’t be sure that I am safe from viruses and other internet threats browsing the site. There’s a chance they do have an antivirus but there’s also a chance they don’t. My rate is 3 stars. How to Make an Order Here? Making an order here seem to be really easy. First of all, that’s because there is no registration mandatory on the website before ordering. I think this is great as it saves customers a lot of time. So, without anything that can stop you since no registration is needed – you can start ordering as soon as you enter their main page, which is obvious since all the medications are only displayed on their main page and there is no searching function. That’s what I don’t really like as there are no searching functions at all, so you need to browse through all their ED medications to find the one that you need. So after you have found your drug, click on *buy now* and you’re on the informational page about that drug. 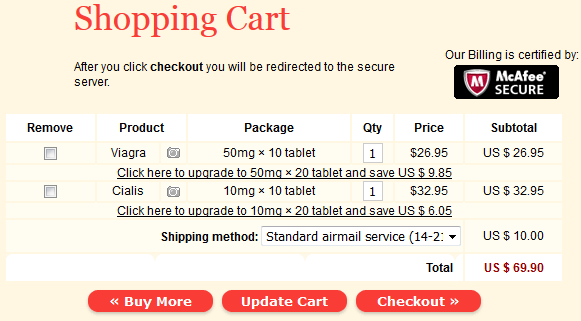 Select the needed dosage and the needed quantity there and click on *buy now* next to it. You should see your shopping cart where you review the information, your total and select shipping method. Click checkout. On the secure checkout page just enter the billing / shipping address, review all the information, enter the payment info and that’s it. I think that this online pharmacy deserves a rate of 4 stars here since ordering here seem to be fast, but there is no option to change the language or the currency and they do not offer the searching function either so customers may not find it too convenient. But due to the fact that there’s no registration mandatory and everything seem easy and fast they do deserve 4 stars. The screen shot that I have shared above is showing the scamadviser.com report and as much as we can see, the results are not good at all. 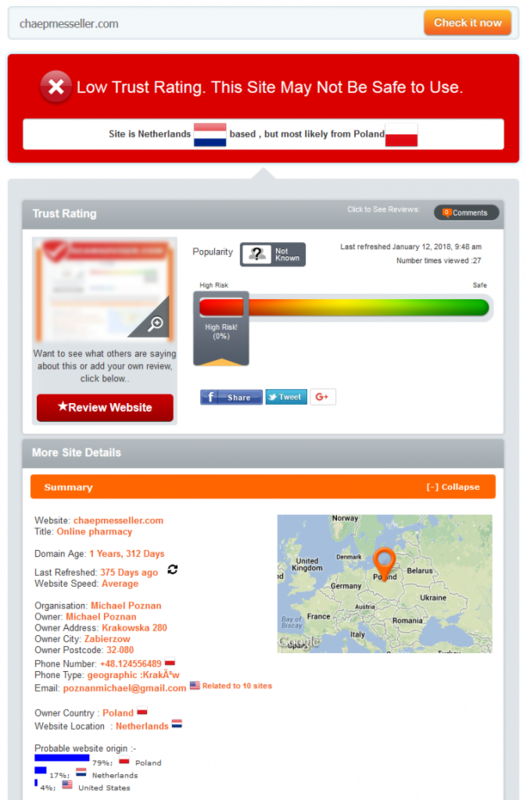 The site got a low trust rating and it means it may not be safe to use which is a big problem. It indicates a high risk because it got 0% of trust. The site may be from Netherlands but also from Poland too. It has a long list of alarming notes as to why this pharmacy can be dangerous to be used and plus to that, the domain age is only 1 year, but we were said that the company is in business for 12 years. I definitely don’t like all of this and I doubt that this report deserve any more than 1 point. I was searching for information if this online pharmacy is asking for a valid prescription and on their website you can find such information: *Some products available in our pharmacy require a valid prescription. * What’s strange is that despite this information – there was nothing that could have stopped me to place an order and plus to that, there was no warning on no medication suggesting it requires a valid prescription and I was ready to place an order without any issues. I can’t be sure, but it seems the pharmacy is not actually asking for any prescriptions. Only because I can’t be sure my rate is 3 points. Unfortunately, legitscript.com seems to agree with scamadviser.com on the fact that this online pharmacy shouldn’t be used. It has a rogue status on legitscript.com and I do think that’s a huge problem as a rogue internet pharmacy is indicating the pharmacy is having serious issues breaking the laws and customers rights. Ordering from such pharmacies you are not guaranteed you would get what you pay for. My rate is 1 star. 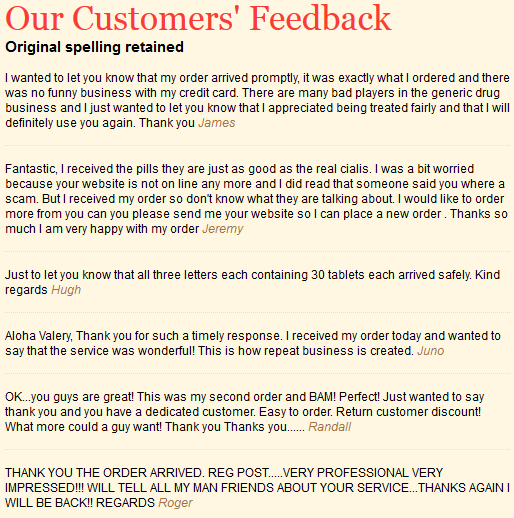 There is an entire page dedicated to customer reviews which you can find on the site named *testimonials*. The words those customer reviews they are saying about this pharmacy are really amazing as every single word is suggesting how good this pharmacy is since it offers excellent services, good medications, fast shipping, low prices and much more. But there are multiple problems with these reviews which make me think they are fake reviews. One of them is – I have no idea how they appeared there because there’s no way to write a review myself – they were chosen by the administrator. Secondly – the reviews have no dates, which means we have no idea when they appeared so they may be outdated. The last and the biggest problem – those are most likely fake reviews. I have read the exact same reviews on multiple different sites. I think there’s just one explanation why those reviews are there – to misinform people in order to make them believe the site is functional and trustworthy. Fake reviews receive 1 point. The website has fake reviews on their site so I was interested in reading reviews on other third party websites as I think they are much more trustworthy. However, I couldn’t find any. There are no customer reviews that we could have trust in and I think this is a huge problem. There is not a single word about chaepmesseller.com on third party websites so that’s making me wonder – how they can claim to be one of the leading pharmacies on Internet? I do understand their site is online for only a year, but without reviews my rate can’t be higher than 1 star. I have earlier mentioned in my review the fact that this pharmacy is offering savings if you’re purchasing more pills at once. The more pills you purchase – the more money you can save. Except for this, I have found out that they are offering free ED pills. But there’s a problem - except for this there’s nothing else. No free shipping, no coupon codes, discounts or anything else. I think that this unit deserves only 2 points. Customer support service is something extremely important I have checked their *Contact Us* page in order to find out what’s the contact info they share and unfortunately, I wasn’t really satisfied. All that I managed to find there is 3 phone numbers and the contact form. The pharmacy must add the address of the pharmacy, email, fax number and others. 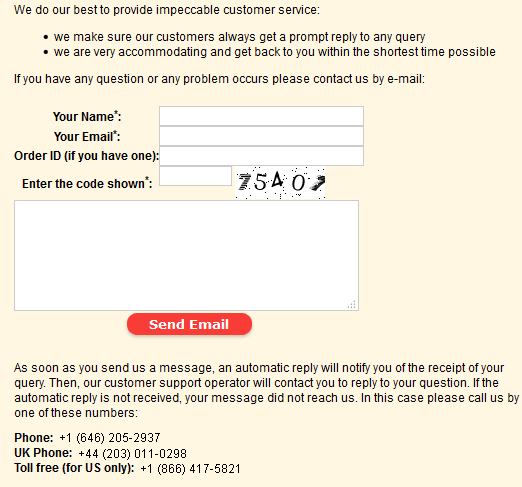 My rate for only the contact form and phone numbers is 2 stars. Unfortunately, it seems that getting a consultation is impossible on this online pharmacy and that’s due to the fact that I contacted them through the contact form (I do not like talking by phone so I don’t call pharmacies – but people may do it if they want to) and no response ever arrived. I tried to ask them about the address of the pharmacy and about the coupon codes or ways to save money but nobody responded after more than 24 hours. Obviously my rate is 1 star. Chaepmessller.com is an online pharmacy that is only offering generic ED treating medications all over the world. 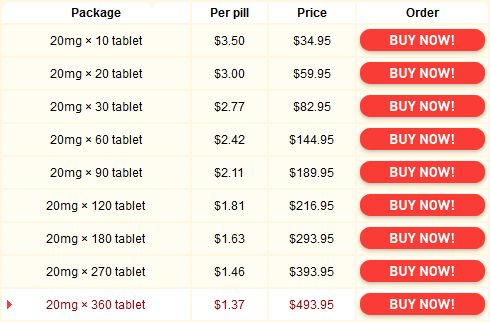 The company is offering affordable prices for generics but definitely not the best out there. Customers can purchase only ED drugs here and only generics. They can order regardless where they live but they can pay only with Bitcoin or credit cards. The website has average technical characteristics but there are other big issues. The pharmacy has fake reviews on their own website, they lie about how much time they are online and that they are a leading internet pharmacy. They got no trust from scamadviser.com where many other issues were discovered and they got a status of rogue on legitscript.com. Besides the fact they lie too much and have no trustworthiness – there is no customer reviews on other websites and no customer support service that answers to your questions. I doubt that’s the best pharmacy you can buy medications from.